NOTE: You can download the Detour app for iPhone or Android, for free, by clicking here. Detours are experiential: you can’t “do” them from home. This one starts at 24th and Mission Streets in San Francisco. More details here. Roberto Hernandez, the “Mayor of The Mission,” takes you deep into the Mission with people who intimately love the neighborhood, but in very different ways. Roberto introduces you to all kinds of ‘locals’: from tech-worker newcomers drawn to the neighborhood’s buzz to Latinos who treasure the neighborhood’s traditions. And as we travel, they all meet each other to ask: What does it mean to belong in a place in the midst of unprecedented change? Along the way, you’ll make an illegal left-hand turn with the coolest low-riders rolling 24th Street. You’ll visit a controversial new restaurant and eat hot hand-pressed tortillas at the neighborhood’s staple Mexicatessen. You’ll see a million dollar condo and a house for sale for $9,000. You’ll hear the conga drums of Carnaval, decode neighborhood murals, and stop into a backyard patio full of tech workers writing code for start-ups they hope will be the next Uber or Airbnb. 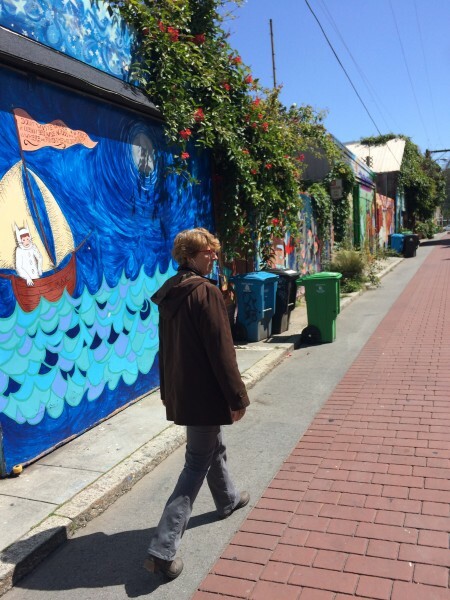 Listen to Julia Scott and Detour founder Andrew Mason discuss the impetus for creating a Detour that focuses on the sensitive issue of gentrification on KQED’s Forum with Michael Krasny. Detour-takers “may find themselves surprised by details that go unnoticed, even by natives,” writes Mission Local.